Investors looking to avoid underperformance should steer clear of InfraCap MLP ETF AMZA. 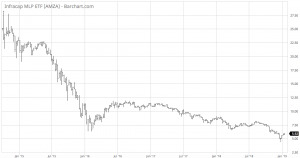 The fund recently hit a new 52-week low. 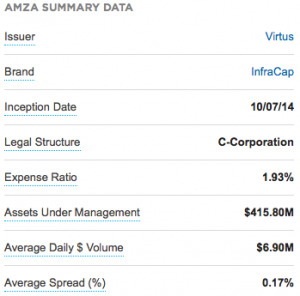 Shares of AMZA are down roughly 32% from its 52-week high of $11.49/share. But is more pain in store for this ETF? Let’s take a quick look at the fund and the near-term outlook to get a better idea of where it might be headed. AMZA seeks total returns primarily through investments in equity securities of publicly traded master limited partnerships and limited liability companies taxed as partnerships (see all MLP ETFs here). Crude oil has been gaining a lot of traction lately. Crude prices have been seesawing this year, rising 35% from its 2017 low to touch the highest level in more than two years only to come under pressure from on Nov 14. The International Energy Agency’s (IEA) doubts over the prevailing ideas of tightening fuel markets and forecast of lower demand growth for this year and the next weighed on oil prices. Plus, rising U.S. crude supply is another cause for concern. Moreover, benchmark U.S. treasury bond yields dived on confusion over the seamless passing of President Donald Trump’s tax reform. All these marred MLP ETFs like AMZA, for the segment normally thrives on two factors – higher oil prices and lure for dividend. If oil prices remain on a freefall and yields remain subdued, investors may have to avoid this ETF. The fund has a weighted alpha of -30.6.